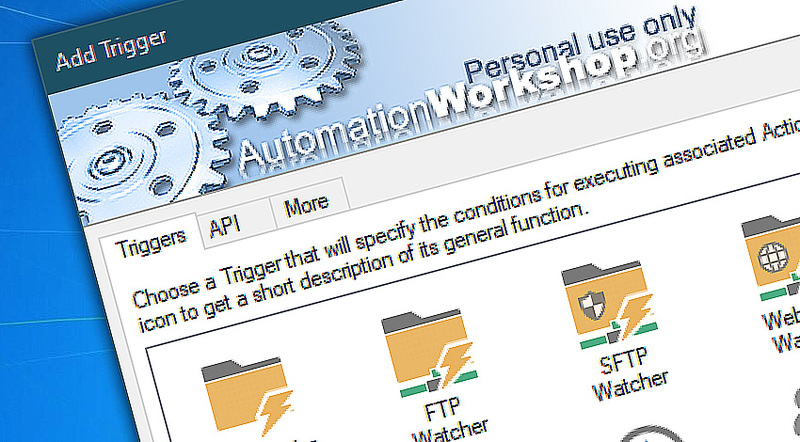 Automation Workshop uses Triggers to continuously monitor the system for specified states, processes or changes. When the Trigger detects a predetermined type of event, it launches the Task that automatically executes one or multiple Actions to perform the necessary work. Triggers initiate automated processes when an event matches narrower or broader criteria specified in their parameters. 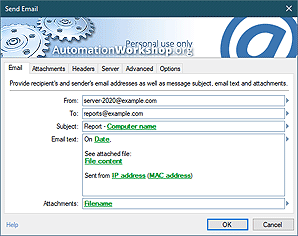 Automation Workshop can monitor file system for various changes, execute Tasks on schedule, upon user login / logout event or system start / shutdown. Tasks can also be started manually on user request. File / Folder Watcher · monitors system for file system events related to files and folders. Task Scheduler · advanced Task Scheduler executes Tasks on regular or irregular schedules. User Logon / Logoff · detects when all or particular users log in or out the system. System Startup / Shutdown · detects when Windows is started or shutdown. Manual run · user can start the Task manually. By monitoring the system for specific events, Triggers allow to respond pro-actively and get the job done in no time. Triggers · conditions of automatic Task execution. Actions · sets of operations comprising workflow. Thanks for the Automation Workshop program, I really like it a lot! —Matrin H.